Artist's illustration of NASA's New Horizons spacecraft encountering a small Kuiper Belt object (KBO) beyond Pluto. The probe will fly by the KBO 2014 MU69 on Jan. 1, 2019, if NASA approves and funds a proposed extended mission. The public should know soon if NASA's New Horizons spacecraft will get to perform a second epic flyby in the dark depths of the outer solar system. New Horizons team members have officially submitted an extended-mission proposal for the probe, which captured the first-ever up-close looks at Pluto during a historic flyby of the dwarf planet last July. NASA is now evaluating the proposal and will decide by June or July whether to approve and fund this "Kuiper Belt Extended Mission" (KEM), said New Horizons principal investigator Alan Stern. 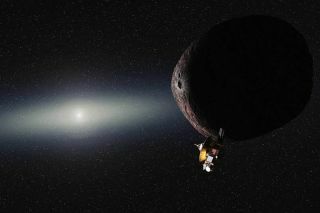 "The planned flyby will approach MU69 to about 1,900 miles (3,000 kilometers), which is about four times closer than we flew past Pluto," Stern, who's based at the Southwest Research Institute in Boulder, Colorado, wrote in a blog post last week. "Consequently, imaging and compositional mapping spectroscopy resolutions are all expected to be even better than what we achieved at the Pluto system," he added. "If I do say so myself, the flyby of MU69 would be a landmark event, shattering all distance records for deep-space exploration, and yielding an impressive scientific bounty." The 2014 MU69 object is between 13 and 25 miles (21 and 40 km) wide. So the object is about 1,000 times more massive than Comet 67P/Churyumov–Gerasimenko, which Europe's Rosetta spacecraft has been orbiting since August 2014, and about 500,000 times less massive than Pluto, Stern said. "This places it in a key intermediate size regime to better understand planetary accretion," he wrote. "And given its 4-plus-billion-year existence in cold storage [while located] so far from the sun, MU69 will be the most pristine object ever visited by any space mission." If NASA green lights the KEM, New Horizons will study 2014 MU69— which lies about 1 billion miles (1.6 billion km) beyond Pluto's orbit — with all seven of the probe's science instruments, characterizing the object's surface, and searching for moons and an atmosphere, among other activities. But the KEM wouldn't just be about the 2014 MU69 close encounter. For example, New Horizons would also conduct 16 to 20 "distant flybys" of other Kuiper Belt objects (KBOs) and search for rings around a number of KBOs from 2016 through 2020, Stern wrote. The spacecraft would also continue studying gas, dust and plasma in the Kuiper Belt and, possibly, perform some astrophysical observations before the KEM wraps up in 2021, Stern wrote. New Horizons is already on its way toward 2014 MU69; the spacecraft performed an engine burn late last year to help pave the way for the potential flyby, should NASA approve an extension. Stern expressed optimism that this will indeed happen. "With New Horizons so healthy, so capable of carrying out KEM and so successful at Pluto, we are optimistic about our proposal, which NASA will soon have peer-reviewed," he wrote in the blog post. "If KEM is approved, we will begin both KEM science observations and MU69 flyby planning this fall. If the proposal fails, we will have to turn the spacecraft off in December for a lack of funds to continue."